Crunchy leaves. Warm scarves. Hot chocolate. MAKEUP. Berry tones… rich reds, sumptuous purples, royal blues, emerald greens… stop, I’m getting too excited. I just can’t cope with all the beautiful colours that come along with my most-favourite season. I’ve dug out some old favourites, and there are of course some delicious new picks to keep me going through Autumn. Base-wise, I am all about the NARS tinted moisturiser. Seriously dreamy stuff, it is so moisturising and lovely, but gives nice coverage. On any troublesome areas, the Kevyn Aucoin SSE is a god-send. On my cheeks, NARS douceur is rocking my little world at the moment – it sculpts, adds nice colour and is blush-y without being too much. I either go for a bolder eye or a bolder lip… if I wear both, I look too much like a night-crawler. That’s a look I am all for, but not in the middle of the day when I’m trying to work or just mooching around. Mooching around is my speciality. Bold eyes – By terry ombre blackstar in brown perfection. It’s… perfection. A warm, rich & creamy bronze brown shade, that is pretty much all you need. It can be scribbled all over the lid, and under the eye, and pretty much anywhere. Anywhere. For more exciting colour days, NARS Desdemona is where you should head… a purple plum shade that is all smokey and delicious and exciting. Oh boy, it’s such a beauty. With a heavier eye, my trusty Tom Ford pink dusk lipstick comes into play. If I crave a deeper lipstick colour (I so often do), then lord knows I have plenty to choose from. 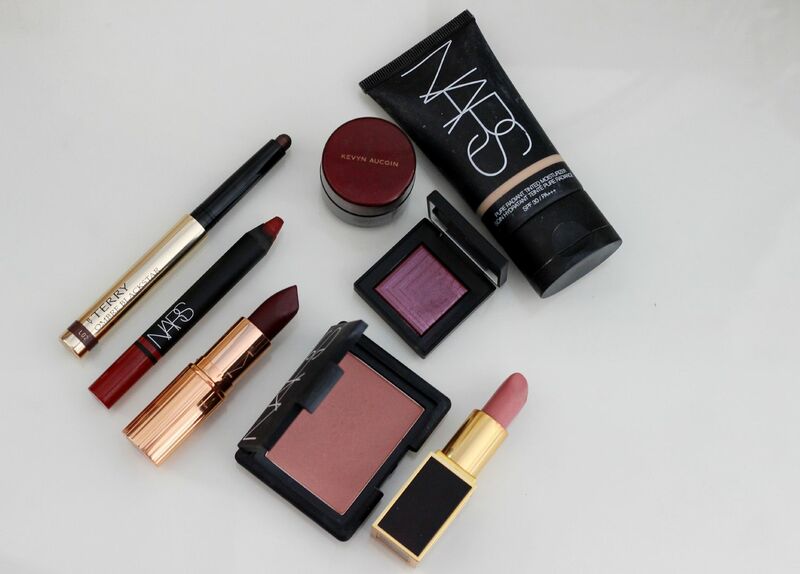 Some favourites at the moment include any of the Audacious lipsticks, NARS Mandore or Charlotte Tilbury Glastonberry. Those are only some examples, but basically anything slightly vampy or rich, and I’m all over it.